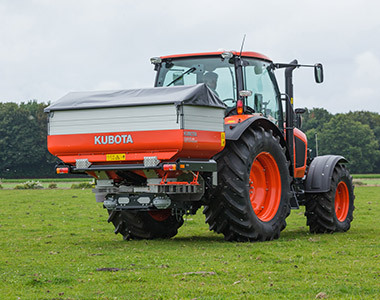 The Kubota DSM-W ISO GEOSPREAD Series is the ideal spreader for arable farmers and professional dairy farmers. 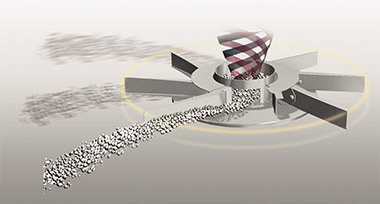 The GEOSPREAD system does section control with sections of only 2 metres. With a maximum of 14 sections and the possibility to switch sections over the middle, unnecessary overlap is set to an absolute minimum. 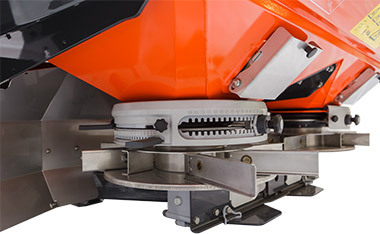 The 4 load cells and reference sensor on the DSM-W ISO GEOSPREAD spreader are important features as with section control accurate weighing is essential. The total benefit of GEOSPREAD combined with speed related spreading and GEOPOINT headland management can be up to 15%. This can be achieved by saving fertiliser and better yields, because of unnecessary overlap. 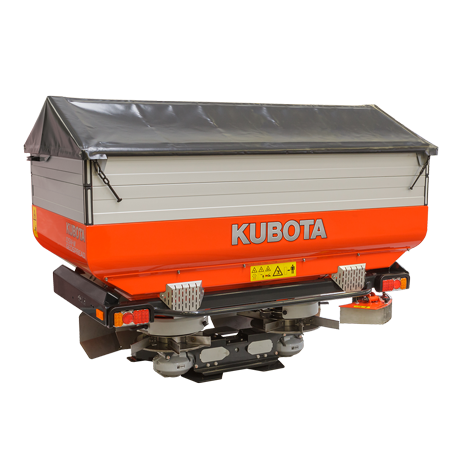 This Kubota DSM-W ISO GEOSPREAD spreader is ISOBUS compatible and AEF certified. You can operate the spreader in combination with the IsoMatch Tellus, IsoMatch Tellus GO or any other ISOBUS compatible tractor terminal. When running IsoMatch GEOCONTROL in addition to GEOSPREAD you can set the DSM-ISO GEOSPREAD more accurately. The working width will be automatically adjusted to suit the overlap and coverage using a GPS positioning system. For example, when driving in a wedge or irregular shaped field, GEOSPREAD will start to decrease the working width step by step. GEOSPREAD is using the section control function of the IsoMatch Tellus software which is in the IsoMatch Tellus terminal. The spreader working width is divided into a minimum of 2 metre sections (max. 14 sections on DSM-W GEOSPREAD and max). Not only the spreading width is adjusted, the application rate (kg/min) is also adjusted automatically to match the revised spreading width. This unique combination of working width and application rate adjustment makes the GEOSPREAD system extremely accurate, with minimum influence on the spread pattern coefficient of variation. The compact FlowPilot ‘dashboard’ gives you considerably simplified accurate setting and adjustment of applicaton rates. Two hydraulically operated metering plates, each with three discharge openings ensure an equal fertiliser flow from the hopper to the spreading discs. 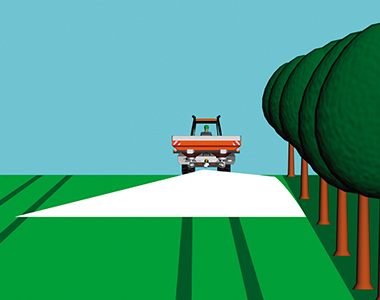 You are ensured of the ISOBUS compatibiliy from tractor to the spreader and spreader to tractor, meaning that all data collection from your spreader is centralised and can be easily transferred to your (tractor) terminal in your tractor cabin. Easy plug and play! The IsoMatch Tellus GO is a Universal Terminal. 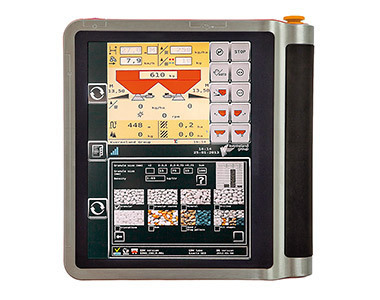 This multifunctional one-screen terminal has been developed for fast and simple control of any ISOBUS implement, giving the farmer a ‘custom made’ experience as it suits all needs for simple and efficent handling of farming machinery and tasks. 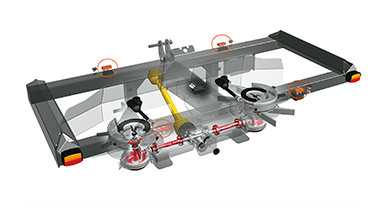 To ensure a consistent flow when spreading low quantities, the RotorFlow system is equipped with a fine application kit. Ideal for spreading low quantities, seeds and slug pellets. 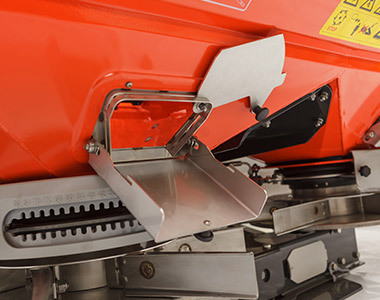 With the AutosetApp you have always the most up to date settings for your weighing spreader available. The AutosetApp is an App (software application) available on the IsoMatch Tellus terminal. The AutosetApp is standard integrated into the IsoMatch Tellus GEOCONTROL software. This App connects the IsoMatch Tellus terminal directly with the DSM-W GEOSPREAD weighing spreader and will automatically adjust the spreader according to the settings entered into the App.